How Much Inflation have we had since 1913? Just like compound interest compound inflation grows faster and faster. The average annual inflation since 1913 is “only” 3.42%. But as you can see from the chart to the right compounding something for almost 100 years at 3.42% will result in over 2000% inflation. A 2071% increase is a hard concept to grasp so to put it another way, something that cost $1.00 in 1913 would cost $21.71 today ($1 + $20.71 inflation). Or conversely a dollar today is only worth 4.8¢ in 1913 dollars. In other words the government over the years has stolen 95.2¢ out of every dollar. If that isn’t bad enough, actually the situation is even worse than that. If you look at the chart carefully you will see that inflation was fairly steep during the “teens” from 1913 – 1920. Then during the 1920’s and 1930’s inflation actually declined. 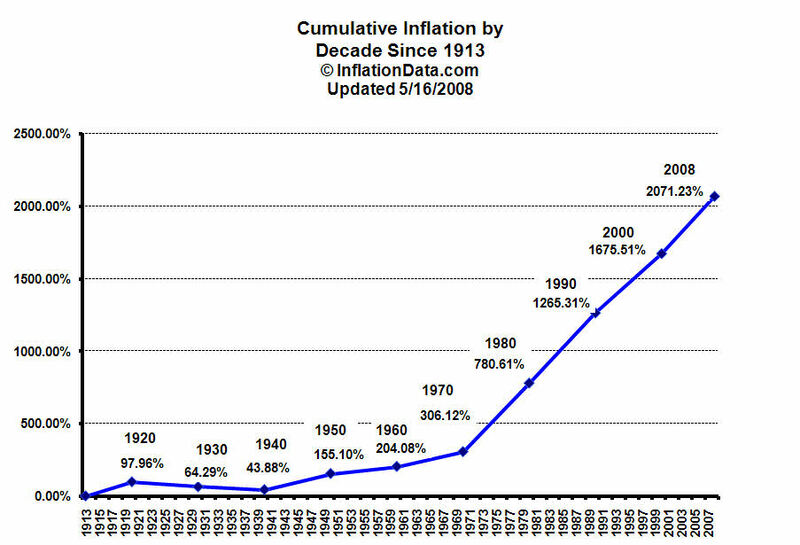 So actually most of the 2000% inflation occurred since 1940. The average annual inflation rate since 1940 has been 4.11% with the 1940’s, the 1970’s and the 1980’s having 5.63%, 7.09% and 5.55% average annual inflation respectively. Each of those decades were especially hard economically for people trying to make ends meet while prices increased and wages didn’t keep up. See our chart of inflation rates broken down by decade for more info.